Bamboos make excellent garden hedges, screens, or windbreaks and can be cut or trimmed in the same way as you would do with traditional hedging plants such as boxwood. The main difference between a screen and a hedge is that hedges generally are more formal in appearance and are shorter whereas screens are much higher and informal. You can cultivate a low hedge by choosing a species that has a height rating to suit your finished hedge requirements, or by pruning and trimming a taller species down to the height you desire. Please see my page on pruning bamboo for information on pruning, branch cutting, and trimming bamboo for additional techniques. You should choose the species for your bamboo hedge according to your required end result. Start by deciding on the height, colour, density, and leaf size that will be suitable for your location or garden design. Also consider how you are going to control the growth of your hedge and/or contain it in the desired area. Please see my section on control and containment for a guide on these methods. 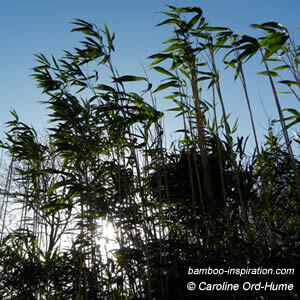 The bamboos listed below are some of the species that make great hedges of different shapes. Chimonobambusa list - vigorous growth and spreading. Fargesia nitida - Purple stems, narrow, straight, fountain branches, height 2m to 4m (7 - 13 ft.), clumping. 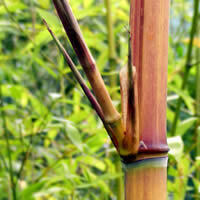 Fargesia nitida Jiuzhaigou 1 - Red bamboo culms, slender and straight growing to a height of approximately 2m to 4m (7 - 13 ft.) with small leaves and changeable cane colours. Growing in popularity as an attractive open clumping plant for hedges to provide privacy in your garden. Other variations of Jiuzhaigou provide different heights and colour. Fargesia list - Most of these species will be good for hedging. Hibanobambusa Tranquillans 'Shiroshima' - Very rare - Moderate spreading - 2 branches per node - Variegated cream and white striped leaves can grow to 10 inches long by 1 1/4 inches wide - Maximum height: 16' - Maximum diameter: 1 1/4"
Indocalamus latifolius 'Solidus' - Shade bamboo - running - Leaves are 8 to 10 inches long - Maximum height: 8' - Maximum diameter: 3/8"
Indocalamus tessellatus Tessellatus - Moderate spreading, can grow in containers - edible - largest leaves of up to 24 inches long by 4 inches wide - Maximum height: 7' - Maximum diameter: 1/2"
Phyllostachys aurea 'Golden bamboo' or 'Fishpole Bamboo' - Good for hedging and excellent for screening and container - clumping but can spread aggressively in areas with warm summers - edible - Culms used for fishing rods, walking sticks, umbrella handles, crafts projects, and interior decoration - Maximum height: 27' - Maximum diameter: 1 3/4"
Phyllostachys aureosulcata spectabilis - Cold hardy and beautiful bamboo with potential to grow to 30ft (9 metres), average of 20ft (6 metres), culm diameter 1-2", depending on conditions. Phyllostachys bissetii 'Dwarf Bisset' - aggressive spread and vigorous growth - early shooting in spring - Used for handicrafts, tools, and splits can be woven - Maximum Height: 18' - Maximum Diameter: 1"
Pleioblastus chino elegantissimus - A moderate spreading - green leaves with thin white stripes varying in lengths - Maximum height: 10' - Maximum diameter: 3/4"
Pleioblastus chino 'Murakamianus' - Moderate spreading - variegated leaves with white stripes - Maximum height: 10' - Maximum diameter: 3/4"
Pleioblastus chino elegantissimus - Moderate spreading - green leaves with thin white stripes varying in lengths - Maximum height: 10' - Maximum diameter: 3/4"
Pleioblastus chino vaginatus variegatus - Moderate spreading and deep running rhizomes - smaller, narrow white striped leaves and very ornamental - Maximum height: 6' - Maximum diameter: 1/2"
Pleioblastus distichus 'Dwarf Fernleaf' - Short hedge, container, or ground cover, with very aggressive spreading - tiny leaves that are sometimes only 1" long by 1/4" wide - Maximum height: 2' - Maximum diameter: 1/8"
Pleioblastus fortunei Dwarf Whitestripe - Hedging, container or ground cover - aggressive spreading - green, cream and white variegated leaves popular ornamental bamboo - Maximum height: 4' - Maximum diameter: 1/4"
Pleioblastus linearis - Aggressive running - long narrow leaves like grass - sometimes used for roofing - Maximum Height: 14' - Maximum Diameter: 1"
Pleioblastus pygmaeus 'Ramosissimus' - Medium hedging - hardy with fan shaped leaf pattern - Maximum height: 6' - Maximum diameter: 1/8"
Pleioblastus shibuyanus 'Tsuboi' - Quite rare vigorous running bamboo - also attractive container and ground cover plant - small varying white or cream striped leaves - Maximum height: 9' - Maximum diameter: 1/4"
Pleioblastus viridistriatus Dwarf Greenstripe - Shorter hedge and nice for ground cover or container plant with aggressive spreading - golden yellow leaves with green stripes in spring approximately 7" by 1 1/2" - can be mowed in winter - Maximum height: 3' Maximum diameter: 1/4"
Pleioblastus viridistriatus chrysophyllus - Low bamboo hedging, or suit ground cover and container planting - golden yellow leaves with faint green stripes approximately 7" by 1 1/2" - can be mowed in winter - Maximum height: 3' - Maximum diameter: 1/4"
Pseudosasa japonica 'Arrow Bamboo' Clumping or moderate spreading habit - large drooping leaves can grow to 12" by 1 1/2" - A shade tolerate bamboo to harvest for use in crafts such as arrow making - Maximum height 18' Maximum diameter 3/4"
Sasa nipponica 'Ward' - Aggressive spreading, but too short for a screen - green leaves that develop cream and tan coloured edges in autumn - Maximum height: 2' - Maximum diameter: 1/8"
Sasa palmata - Aggressive spreading - also does well in containers and as a houseplant - leaves are leathery and thick and can be up to 15" long by 2 1/2" wide - grows well in cooler climates - Maximum height: 7' - Maximum diameter: 1/2"
Sasa veitchii 'Kuma Zasa' - Aggressive spreading - dark green leaves approximately 10" long by 2 1/4" wide that turn to a creamy white in autumn - culms turn purple or purplish green on maturity - Maximum height: 5' - Maximum diameter: 1/4"
Sasaella masamuneana albostriata - Makes a good bamboo hedge with aggressive spreading but too short for screening - thick leaves, variegated with cream or white stripes - Maximum height: 6' - Maximum diameter: 1/4"
Sasaella ramosa - Makes good hedging being a good runner, too short for screening - is also suitable to grow in containers - generally approximately 3' tall - Maximum height: 6' - Maximum diameter: 1/4"
Shibataea chinensis - Moderate spreading - Maximum height: 2' - Maximum diameter: 1/8"
Shibataea kumasaca - Slow spreading - leaves are short and broad - culms have slightly zigzag internodes and prominent nodes - Maximum height: 7' - Maximum diameter: 1/4"
Shibataea lancifolia - Ornamental hedging and screening with moderate spreading - longer and narrower leaves than other species - Maximum height: 7' - Maximum diameter: 1/4"
Even taller for a windbreak!